Conveniently located, The Ikon offers comfortable accommodation to its guests. Located close to Ashoka Park, The Ikon offers 24-hour front desk to its patrons. The 2-floor hotel has 15 well-furnished rooms that have attached bathrooms. Amenities in the rooms include televisions, safes, minibar, hair dryer, tea/coffee makers and writing desk. The hotel also offers its guests wake-up calls and buffet breakfast. Guests can avail of travel desk, elevator and parking facility. Room service, iron and ironing board on request and laundry are also offered for the convenience of the guests. 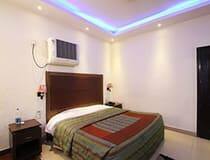 This hotel is located at 20 km from the Maharana Pratap ISBT and at 21 km from the Indira Gandhi International Airport. Guests can visit the India Gate (12 km), Red Fort (16 km), Humayun's Tomb (10 km), and Qutab Minar (11 km).